Mix feta cheese and dill/parsley in a small bowl. Place Phyllo Pastry sheets on top of each other and cut them in half. Then again cut the 2 pieces crosswise from the corners and form 4 pieces (see the picture). Place 1 tsp of filling on the wide sides (see the picture) and fold the corners inside (see the picture). Then, roll them up (see the picture) and soak the end to water and close it up. Roll all the sheets up in the same way (you can use 2 pieces of sheets together since the sheets are very thin, but it is up to you). Sizzle the oil in a large skillet and fry the both sides of Cigarette Boreks over medium heat till their color turn into a light golden brown color. After that, place them on a paper towel to soak the excess oil up. Place them to a serving plate and serve warm. P.S: If you are using Turkish-style pastry sheets, cut them in 16 triangular-like pieces and then follow the intructions described above to roll up and fry. P.S: The Phyllo Pastry dries quickly, so roll them up quickly or cover the ones you aren’t using with a clean cloth. Yufkalar bitene dek bu islemi uygulayin. Genis bir tavada yagi kizdirin ve sigara boreklerin her iki tarafida kizarana dek orta ateste kizartin. Sigara boreklerini kagit havlu uzerine alip, fazla yagini almasini saglayin. Servis tabagina alin ve sicak servis yapin. NOT: Eger normal yufka kullaniyorsaniz, yufkayi 16 esit parcaya bolun ve yukarida anlatildigi bicimde sarin ve kizartin. NOT: Phyllo Pastry cabuk kurudugu icin, sigara boreklerini cabuk sarin ya da kullanmadiginiz yufklari temiz bir bez ile ortun. 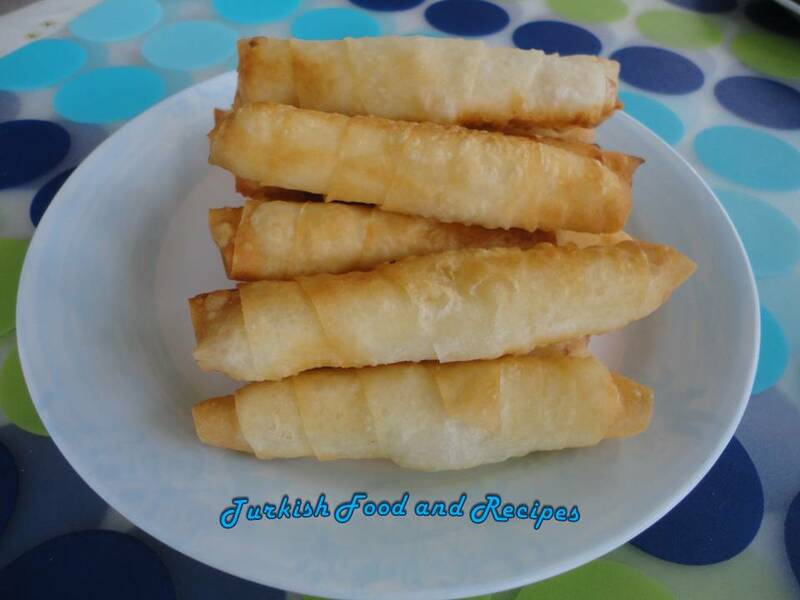 How many börek do you make using this receipe and these measures? 2 sheets of phyllo makes 4 cigarette boreks. And this recipe makes 40 pieces of boreks. And 2 Turkish yufkas make 32 pieces. I wish I could find Yufka. It is so much better than phylo dough.